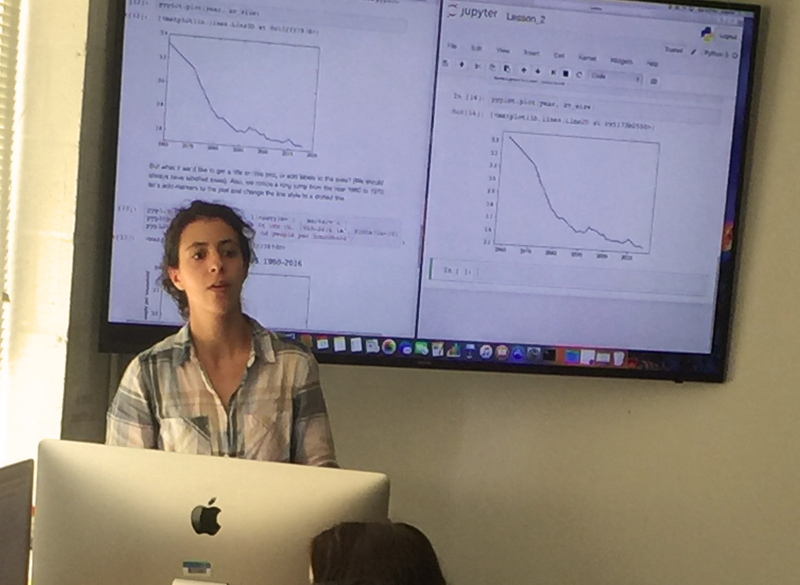 Natalia Clementi, PhD student in the Barba group, teaching high-school students about data visualization with Python. PhD student Natalia Clementi and Prof. Barba taught a 3-hour tutorial for high-school students for the Caminos Al Futuro program of the GW Cisneros Hispanic Leadership Institute. It was a hands-on tutorial titled "Data Science for a Better World," and it guided the students through the basics of using Python with data. The students, who had never written code before, learned to use a Jupyter notebook to manipulate data in the form of arrays, visualize the data with line plots, and analyze it with linear regression. The context applications were the decreasing size of households in the US (leading to more energy consumption per capita), and the increasing earth temperature over time. Caminos al Futuro is a Summer program for high-achieving juniors (rising seniors). The program aims to develop leadership and scholarship in the Latino community. Students are fully funded to attend.